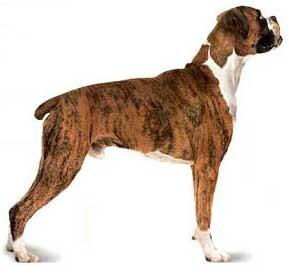 The Boxer, being the sixth popular breed in the United States, was bred from the English bulldog and extinct Bullenbeisser. It is a part of the Molosser, masriff group. They emerged in Germany during the nineteenth century and were called boxers because of them making “boxing” movement with their front paws. Boxers are stout and mid-sized with strong jaws and a mighty bite ideal for hanging on to large prey. They are presently used in police departments, for search and rescue and military work. The lifespan of boxers is generally 8 to 12 years. They are normally healthy dogs btu may often suffer from serious health problems such as cardiomyopathy, sub-aortic stenosis, hip dysplasia, cancer etc. Other health problems include digestive problems, allergies, epilepsy and skin problems.